"Offering wonderful views of the Punnamada Lake, Punnamda backwater resort is one of the best heritage-style hotels of Alleppey, offering comfortable stay amid world-class comforts. The resort overlooks the tranquil backwaters of the Punnamada Lake that runs along it, and boast of an interesting rustic feel. Sit outside your villa and treat your eyes to the wonderful views. Accommodation is in the form of villas and houseboats. Surrounded by lush patches, the resort has contemporary comforts such as multi-cuisine restaurant, swimming pool, internet connection and so on. 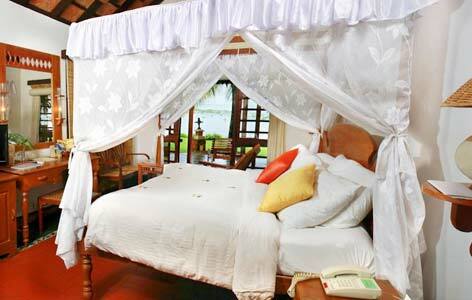 Lying on the banks of Lake Vembanad, Lake View Villas are like an oasis of luxury. Every rooms has wide windows so that the guests can enjoy the surrounding views. 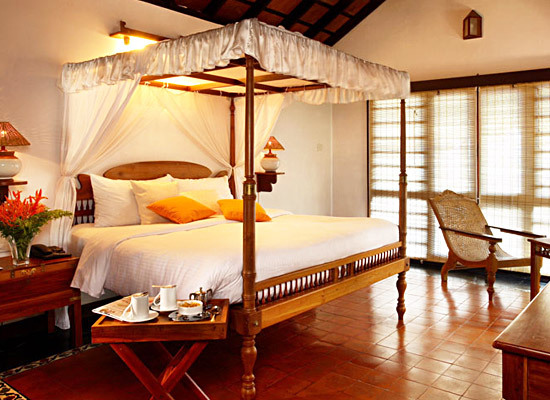 Rich fabrics, and use of wood as well as cane add to the traditional Kerala setting of the rooms. In every room, rays of the rising sun kiss you good morning. The villas are huge and well-equipped. Heritage Garden view villas are placed in the middle of the resort, amidst lush surroundings. 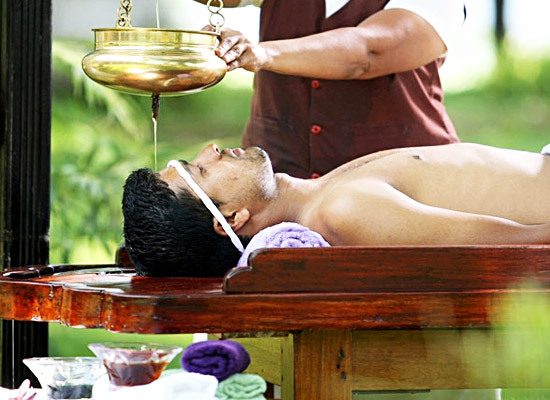 The villas are a wonderful mix of contemporary amenities and facilities and the vintage architecture beauty of Kerala. Heavy wooden doors, windows, upholstery, linen, beams, bed posts, slanted roofs are some of the feature that you can notice. The bathrooms are open-roofed, huge, airy and have pebbled flooring. Ideal for honeymooning couples and families with kids, the Duplex villas face the swimming pool of the resort. As you enter the resort, a huge porch, overlooking the pool welcomes you. On the lower level in the villa, there is a well-equipped, capacious living rooms with washrooms. Then on the upper floor are the bedrooms so that the guests can have privacy. In the evening, enjoy a cup of coffee along with refreshments while savoring the views of the Lake. The furniture and furnishings are elegant and comprise of lampshades, rich upholstery, four-poster bed, rocking chair and so on. The attached bathrooms come with spacious tubs, shower jets and complimentary toiletries. Punnamada resort also has some special disabled-friendly rooms, well-fitted with a built-on ramp for the guests on wheelchairs. All these rooms are on the ground floor, making the movement of these special guests, easy. Customized lifts are provided for accessing all the parts of the property. Hand-railings in the living areas and bathrooms make the movement easier. Kerala and houseboats are synonyms. Traditionally known as Ketuvallams, houseboat is an interesting accommodation option at Punnamda backwater resort. These houseboats have 2 luxurious and spacious rooms. Guests are accompanied by professional staff meeting all their requirements. There is a fully-equipped kitchen handled by a trained, a sheltered deck and dining area. 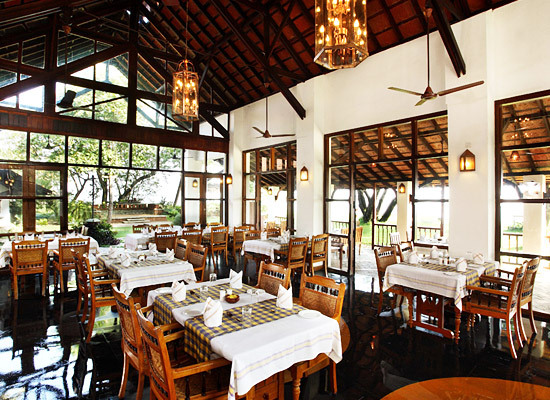 The tourists, staying in Hotel Punnamada Back Water Resort in Alleppey, can enjoy traditional and delectable Indian, as well as local food items at the in-built multi-cuisine restaurant, Choola. People can enjoy their drink at the open air bar of the hotel which is well stocked. Alleppey, in Kerala is one of the most important backwater destinations. The thrilling boat race has the visitors pouring in at Alleppey. People can just laze about on a houseboat or enjoy fishing in the backwaters of Alleppey. Alleppey is a fascinating destination in Kerala that offers backwaters, traditional Kettuvallooms or house boats, boat race, swaying palms, beaches, and tasty food items.